UPDATE: Knife Rights’ Louisiana Switchblade Ban Repeal Bill Passes Senate – CALL/EMAIL Gov. Edwards TODAY! UPDATE: Knife Rights Louisiana Switchblade Ban Repeal Bill Passes House Unanimously! Knife Rights’ bill to repeal Louisiana’s antiquated ban on the possession of switchblade knives, HB 892, was unanimously passed by the House today by a vote of 83-0. The bill now moves to the Senate for consideration. Thanks to all of you who called and wrote your representative to ask them to support the bill. This unanimous vote in the House is testament to the hard work by Knife Rights Director of Legislative Affairs, Todd Rathner, who spent significant time at the Louisiana state house this month. That included negotiating an amendment to the bill with the Louisiana Sheriff’s Association and the Louisiana State Troopers in order to move the bill forward. HB 892 repeals the total ban on switchblade knives in Louisiana and allows for the possession of a switchblade knife provided it is not “intentionally concealed on one’s person.” That provision was necessary to gain the neutrality of the Sheriffs and the State Police. We will let you know when it’s time to fire off those emails and call for the Senate hearing on the bill. 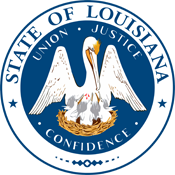 UPDATE: Knife Rights Louisiana Switchblade Ban Repeal Bill Passed Committee – CALL or EMAIL TODAY! Louisiana Representative Mark Wright has introduced HB 200, Knife Rights’ bill to repeal R.S. 14:95(A)(4) which outlaws “the manufacture, ownership, possession, custody or use of any switchblade knife, spring knife or other knife or similar instrument having a blade which may be automatically unfolded or extended from a handle by the manipulation of a button, switch, latch or similar contrivance.” HB 200 also repeals the exception provided for so-called “rescue knives” which becomes redundant with repeal of the switchblade ban. We sincerely appreciate the help and support from our friends at the Louisiana Shooting Association and their President, Dan Zelenka, in moving this bill forward. The bill has been referred to the House Committee on Administration of Criminal Justice. We will let you know when it’s time to contact your legislator on this bill. Stay tuned.